I've always longed for an adventurous spirit, but have finally come to the conclusion that I just don't have it in me, and probably never will. I come from a long line of hard-working, quiet farmers. They labored diligently, and invested in their families, but you won't find a lot about them in the history books. Researching my husband's Adams line, however, has been an exciting thing; they led bold lives, and have led me to believe that the tendency toward adventure must be genetic! With each generation of this family, I have uncovered details about individuals that aren't afraid to take chances, and would stand up for their beliefs. John Quincy Adams was born the sixth child of fifteen, in Vermont. At the tender age of 16, he left his father's home, bound for college. An industrious young man, he worked winters teaching school to earn enough money to support himself and pay his own tuition. After two years, he returned briefly to his father's farm, and then, alone, headed west. 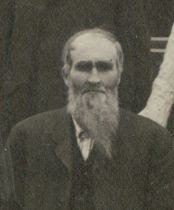 He ended up in Stephenson county, Illinois, where he again taught school, and worked as a carpenter to save up enough money to go to California to work the gold mines. Two years later, like many young men anxious to find their fortune, he headed west again. He was there five years, and returned to Illinois with $1,000, and purchased a 240 acre farm near Florence Station, in Stephenson county. He then settled down, got himself a wife, and raised a large family. John's grandfather, Martin Adams, was a Revolutionary War patriot, who, after serving his time, re-enlisted again. 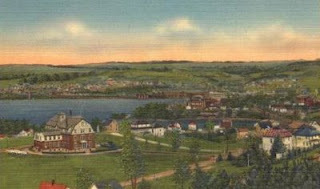 After the war, Martin, along with his parents and siblings, loaded up their belongings in three boats at their home in Springfield, Massachusetts, and set sail, all seven of them, upstream until they got to the present site of St. Johnsbury, Vermont. There, they built the first home, from logs caulked with a mixture of mud and twigs, with pine boughs laid crosswise for a roof. Other settlers moved in during the months to follow. This sort of behavior must have delighted Martin Adams very much, as he did it again after his marriage. This time, he and his brothers, plus their young wives, set out from St. Johnsbury, making their way through heavy forest with all their earthly possessions, to the Barton river. Here they constructed canoes, and rowed to the present site of Duncansboro (Newport), on Lake Memphremagog, in Vermont. They were impressed by the fact that the frost had not destroyed the vegetation there, while everything growing on the hills had been killed, so here they settled, around 1793. By 1800, there were eleven families who had settled there. In looking at the photo above, I can see why they made their decision to stay. As already mentioned, Martin's father, James Callendar Adams, led the family's expedition to St. Johnsbury, with three canoes, seven children, provisions, and everything they owned. Now that's bravery! Personal information on generations previous to this is hard to come by, so I had wondered if they were as hooked on excitement as these more "recent" generations. And then, I uncovered information on George Adams, the immigrant ancestor of James Callendar Adams, and I was not disappointed. George Adams and his wife Frances, left their home in England to come to the New World, specifically, Watertown, Massachusetts. Details of their reasons for making such a perilous journey are a little murkey, but many settlers in this area were Puritans from England, looking for religious freedom, and it was not uncommon that these brave souls sold themselves into slavery for 6 years or longer to pay their fares. The family lived in poverty much of the time, but George had ideas for prospering himself. Perhaps out of ignorance for the law, but more likely due to his strong personal constitution, he bought land from the Indians, paying for it with guns and "strong water." Bad idea! The colonial government was less than pleased, and seized his land, and he spent much of the rest of his life fighting to get it back. Eventually the court realized he had some validity to his claims for the land, but by that time it had been "re-conveyed" to someone else; so in return for his agreement to let the matter drop, they granted him another parcel of land. However, he continued his fight, and eventually the General Court vindicated him, and gave him back his land, plus allowed him to keep the land from the lower court, for his trouble. Along with way, George fought in King Philip's War, was whipped and imprisoned, struggled for years and years with the Court, and survived an Indian massacre. He had the tenacity of a bulldog. It took a falling rock to stop him at the age of 76, at his home in Massachusetts. What was his father like? Or his grandfather? I can only guess! And hopefully some day I'll find out. Until then, I will continue to enjoy the adventurous legacy that this family left to their descendants.